The 15th edition of SOLUTRANS, the international show for road and urban transport solutions, reflects the dynamism of its industry and expects to meet with the same success as its 2017 edition, which had recorded 48,240 visits and 610 exhibitors and represented companies. With eight months to go before it opens, 90% of the exhibition surface area is already booked, with the presence of all the leading French and international industry players. Firmly focussing its sights on the future, the 2019 edition is adopting a digital and electric perspective through an array of actions and events to accelerate developments in the industry. 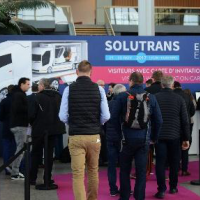 SOLUTRANS 2019 is consequently shaping up to be the largest European gathering of electric heavy goods and urban vehicles from 3.5 to 44 tonnes. The 2017 edition proved to be an out-and-out success, recording 48,240 visitors, 610 exhibitors and represented companies, 45% of new exhibitors and more than €200 million of sales generated by the order intake at the show. For 2019, 90% of the surface area is already booked, an increase of 16% on the same time in 2017. This new edition promises to see similar mobilisation from all market players. To date, the exhibition reports a 16% increase in exhibitors compared to the same period in 2017, including 23% of new exhibitors with Volkswagen, Menci & C.Spa, LAG Trailers BV… and 25% of international exhibitors. The world’s seven largest heavy duty vehicle manufacturers (DAF, Iveco, MAN, Mercedes, Renault Trucks, Scania and Volvo Trucks) have confirmed their presence alongside the main French and European builders of trailers and semitrailers, without forgetting leading LCV firms (vehicle manufacturers, car body manufacturers, LCV fitters and OEMs). Heavy goods vehicles and urban vehicles: basic training and employment undergoing change from production to operation. A white paper on electric vehicles revealing the findings of a study into the feasibility of an electric heavy goods and urban vehicle sector, together with the current state of play and comprehensive proposals to develop electric mobility. SOLUTRANS 4.0: In an era of digital and new tech, the transport and logistics sector is reinventing itself, vehicles are becoming increasingly connected to the extent of becoming totally autonomous. 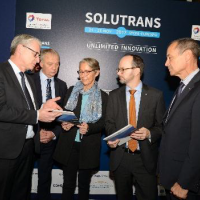 To accompany this fourth industrial revolution, the exhibition introduces SOLUTRANS 4.0, a new space bringing together all the players working in disruptive technology applied to HGVs, urban vehicles and intralogistics, alongside ITC (Information and Communication Technology) suppliers. In association with CARA, 40 forward-looking projects ranging from fundamental research to production will be displayed on this space. SOLUTRANS will also play host to innovative start-ups and showcase technical solutions for the future (3D, virtual reality, etc.) and disruptive delivery models such as drones or robots. Finally, during the exhibition, the French Bodywork Federation (FFC), in partnership with MAYCAR, will launch the FFC Data Center, a dynamic database. It lists all the data from HGV OEMs and builders in order to make vehicle configuration easier and thus reduce delivery times. SOLUTRANS Jobs, know-how and expertise:The wide-ranging subject of jobs and training will be addressed in a dedicated space spanning more than 1,000 m². The aim of this dynamic and functional area will be to reveal and promote jobs in the industry and their associated educational paths and encourage employment in the associated markets. In this aim, a large job forum will be set up, in association with industry specialists, with a view to matching up recruiters and candidates. In a new development in 2019, it will be supported by the creation of a platform dedicated to employment in the industry, launched by FFC in association with Monster, aggregating all the job vacancies and promoting recruitment and building connections between recruiters and applicants. Finally, it will also feature themed talks, job dating sessions, etc. An optimised outdoor test area with better supervision and signage, the provision of high-performance charging stations for unique demonstrations of all types of vehicles (electrical or autonomous vehicles, concept trucks, etc.) In addition to this area, there will be a 25-km semi-urban test track running around the exhibition centre offering a chance to test drive vehicles in real life situations. The Industry Personality of the Year 2019, award, paying tribute to an institutional personality for their actions and commitment to the market. With more than 200 members, CARA, the European Cluster for Mobility Solutions, harnesses the whole industry and its skills to accompany changes in mobility and passenger and freight transportation systems and create the vehicles of tomorrow.